The Rockport Film Review: Take a Trip to Wine Country with Miles and Jack in "Sideways"
Take a Trip to Wine Country with Miles and Jack in "Sideways"
Five years after his hit comedy "Election" Director Alexander Payne received massive critical acclaim, and his first Academy Award, for the 2004 film "Sideways". A buddy comedy that takes you on an unforgettable ride through California wine country. Paul Giamatti is perfectly cast as Miles an English teacher, struggling novelist, and wine aficionado. His best friend Jack is played by Thomas Haden Church, a washed-up actor who now mainly does voice-over work. His obnoxious personality and gregariousness are the perfect match to Miles depressive poor schlub attitude. Jack is a week away from getting married so the guys plan a week-long trip to Wine Country. Recently Miles has been extremely anxious as he's been waiting to hear back from his agent on whether or not his book will be published. He is also still recovering from his divorce of two years ago. This movie is about romanticizing wine and peoples obsession with. The film has actually been shown to have quite an impact on the wine sales and popularity especially for Miles love affair with the Pinot Noir. Jack, on the other hand, is just along for the ride looking to hook up with a few more women before the big day. The reason this is such a great film is that its well written, well acted and above all is hits so many truthful beats. The comedy comes organically from the characters and the situations they find themselves in. Nothing feels forced and every emotion seems to flow and fit together perfectly. Jack and Miles are the perfect odd couple even when they meet up with a couple of women from the area. Miles has known Maya, played by Virginia Madsen, for a number of years but has never had the courage or availability to ask her out. Jack gets know Stephanie, played by Sandra Oh, at one of the Vineyards who also happens to be friends with Maya. The four of them eat and consume several bottles of wine that leads to two different kinds of relationships. Although Jack has not told Stephanie about his upcoming weekend plans, this is a problem he would like to ignore for the time being. But just like an oncoming train, it will have been dealt with and soon. Jack and Miles's friendship is tested many times and none more so than the ending when Miles goes above and beyond the call of duty. They do make it through the week and feel compelled to maybe improve their lives a little. 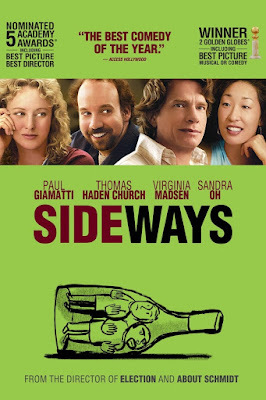 "Sideways" was nominated for 5 Academy Awards including Best Picture but its only win was for Best Adapted Screenplay. It was the most critically praised movie of 2004 sweeping up all the major critics' awards. It's definitely one to own and watch every once in a while for a feel-good laugh. Say Aloha to "The Descendants"